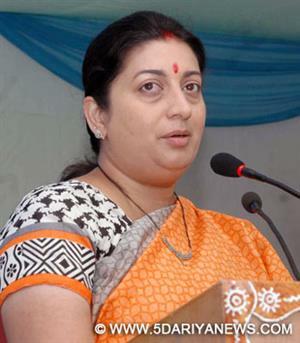 The government Tuesday appealed to all states to adopt and implement the Choice Based Credit System (CBCS) to facilitate student mobility across institutions.Union Human Resource Development Minister Smriti Irani said the credit framework for skills and CBCS would be a "historical step" taken by all states and the Centre towards student mobility and skill enhancement.It would also enable potential employers to assess their performance.Irani was addressing a conference here of education ministers/secretaries of states and union territories on 'Choice Based Credit System in Higher Education and Credit Framework for skills'. "To give students more choices, we had presented the CBCS in front of the country in November 2014, and today we are appealing to all states to adopt this in all their universities and colleges so that our students get more opportunities for mobility," she said. "I appeal that the Choice Based Credit System in Higher Education and Credit Framework is immediately implemented in all your (state) education institutions. And if needed, we are are ready to discuss and extend all support to your vice chancellors and principals in this regard," she added.The credit framework, formulated by the University Grants Commission (UGC) and launched Nov 11 (National Education Day), will allow vertical and lateral mobility within the vocational education system and between the current education systems.The minister also highlighted other initiatives taken by the ministry including the 'Know Your College' portal that helps students make informed choices regarding colleges across the country.